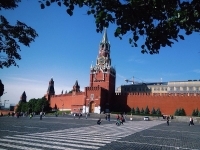 The Kremlin is a fortress surrounded by a thick red wall interspersed with 20 towers that was built between 1482 and 1495. The complex consists of a number of glittering, golden-domed churches and palaces, museums, residences, offices, assembly halls and monuments. It was home to the royal regime during Tsarist rule and from 1918 the seat of the Communist government. Cathedral Square is the religious centre of Moscow and the historic heart of the Kremlin. The attractive Annunciation Cathedral was set aside for the private use of royalty and contains beautifully painted murals and icons on the interior walls. The throne of Ivan the Terrible can be found in the Cathedral of the Assumption, which was used for the coronation of tsars; most of the leaders of the Russian Orthodox Church are buried here and their tombs line the walls of the spacious, richly coloured interior. The Belfry of Ivan the Great is the tallest structure within the walls and a visible city landmark. At its foot lies one of the world's biggest bells, broken in a fall from its bell tower in 1701, and nearby is one of the world's largest cannons, the Tsar Cannon. Also within the Kremlin is the Armoury Palace, the richest and oldest museum, housing a staggering collection of treasures gathered over the years by the church and Russian state, including jewel-studded coronation capes, thrones encrusted with diamonds, royal coaches and sleighs and the renowned jewelled Fabergé Easter eggs, each containing an exquisitely detailed miniature object of precious metal inside. The Diamond Fund Exhibition in the same building contains the 180-carat diamond given to Catherine the Great by Count Orlov. Transport: Metro stop Biblioteka imeni Lenina or Aleksandrovsky Sad.